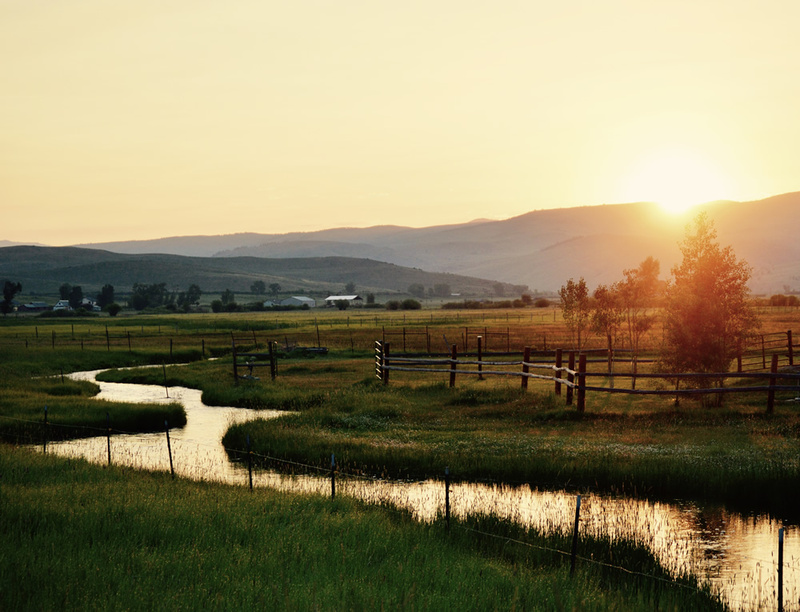 The loss of all or part of a water right due to non-use or the failure to prove diligence on a conditional water right resulting in the loss of the right and its placeholder status relative to other water rights. A water right that is granted permanent status when water has been physically diverted or controlled and put to beneficial use. A volume of water equal to one foot in depth covering an area of one acre, or 43,560 cubic feet. This is equal to approximately 325,851 gallons. A judicial process through which the existence of a water right is confirmed by court decree. The action taken by the State Engineer’s Office when there is not enough water physically available to meet the demands of all water rights holders within a river basin. The right to take water from a natural stream or aquifer for beneficial use at a specified rate of flow, either for immediate use or to store for late use. An underground layer of sand, gravel or rock through which water can pass and is stored. These supply the water for wells and springs and may be alluvial or nontributary in nature. A court-approved plan that allows a water user to divert water out of priority so long as adequate replacement is made to the affected stream system and water right in quantities and at times so as to prevent injury to the water rights of other users. Lawful and prudent use of water that has been diverted from a stream or aquifer for human or natural benefit. The exercise by a senior water right holder of “calling” for his water rights, requiring junior water right holders to allow water to pass to the senior right holder. This is a contract between Colorado, Wyoming, Utah, New Mexico, Nevada, Arizona, and California that was authorized by Congress in 1922 which controls the division of water from the Colorado River. The legal preservation of a priority date that provides a water user time to develop a water right while reserving a more senior date. This becomes an absolute right when the water is actually put to beneficial use. Any use of water that permanently removes it from a natural stream system. This documents the physical diversion and consumptive use of a water right over a period of time. One cubic foot of water passing by a single point for one second. This is a standard unit of measure for water flowing in rivers and streams. An official document issued by the court defining the priority, amount, use and location of a water right. Reductions of water usage, accomplished either through temporary measures such as restrictions during a drought, or through long-term conservation programs. This is the effort accomplished by a conditional water right holder to physically use water for a beneficial purpose, thereby perfecting the water right and making it absolute. Diligence must be proven to the court every six years in order for the conditional water right to remain active and secure its decree date. Water diverted from a river or stream for use without interruption between diversion and use except for incidental purposes. The removal or controlling of water from its natural course or location by means of a ditch, canal, flume, reservoir, bypass, pipeline, conduit, well, pump or other device. A long-period of below-average precipitation. The amount of water that through careful management and use is reasonably required to be applied to a tract of land for a length of time that is adequate to produce the maximum amount of the crops that are ordinarily grown there. An indicator of the well-being and natural condition of ecosystems and their functions. These indicators are influenced by natural changes in environmental conditions. Increasingly ecosystems are being affected by environmental stressors associated with human activities. A process by which water, under certain conditions, may be diverted out of priority at one point by replacing a like amount of water at a downstream location. A sloped channel that is utilized to convey water and is commonly constructed of wood or concrete. Relating to the form of the landscape and other natural features of the earth’s surface. The act of depriving a senior water right holder of their full water right. Water flowing in a natural stream bed or water required for maintaining stream flow or riparian habitat. Water rights that were obtained more recently and therefore are junior in priority to older or more senior rights. A needs assessment is a systematic process for determining and addressing needs, or “gaps” between current conditions and desired conditions. The water demand that is expected to occur in the future after reductions for natural replacement and conservation. Water draw for use that is not consumed, such as water diverted for hydroelectric generation. Underground water in an aquifer that neither draws from nor contributes to a natural surface stream in any measurable degree. A stream or a river is over-appropriated when it does not have enough water to meet the needs of all the water rights holders. This is water that does not contain pollution, contamination, objectionable minerals or infective agents and is considered safe for domestic consumption. The water law doctrine that confers priority to use water from natural streams based upon when the water rights were acquired. The right of a senior water rights holder to divert from a natural stream before junior water rights holders. The date a water right is established and is assigned by the water court. Recreational In-Channel Diversion (RICD) – A quantified amount of water is permitted to remain in the stream for recreational uses and will be protected from other uses that would diminish the decreed flow under the priority system. Kayak and other whitewater recreation course are the most popular forms of RICDs. An impoundment to collect and store water. Water that returns to a stream after it has been used. Any portion of land that borders a natural water course. These areas can be sensitive ecosystems hosting species of plants and animals that are dependent upon this type of environment. Water that flows on the surface of the Earth into streams, rivers, lakes and oceans. The process by which an organization involves people who may be affected by the decisions it makes or can influence the implementation of its decisions. The voluntary relinquishment of a water right’s priority to selected or all junior water rights. Water located on the Earth’s surface. A decision-making concept describing development that meets the needs of the present without compromising future generations. The amount of water lost as it flows from one place to another. This can occur from evaporation, seepage into the streambed, and uptake by vegetation in the riparian area, among other things. The removal and transport of water across the Continental Divide. These diversions are 100% consumptive use as no water is returned to the basin of origin as return flow. A stream or river that flows into a larger stream or river. The area from which water drains by gravity into a water course. Water that is below the Earth’s surface that is physically or hydrologically connected to natural stream water so as to affect its flow whether in movement to or from that stream. A property right to make beneficial use of a particular amount of water with a specified priority date. Areas of standing water or a high-water table that under normal circumstances support vegetation typically adapted to saturated soil conditions. These generally include swamps, marshes, bogs, and areas with vegetation that grows in or around water. Is the percentage of water supplied to the plant that is effectively taken up by the plant that was not lost to drainage, bare soil evaporation or interception. A systematic approach for monitoring and protecting the ecological health of a river’s watershed. The land area, or catchment, that contributes water to a specific water body. All the rain or snow that falls within this area flows to the water bodies as surface runoff, in tributary streams, or as groundwater. 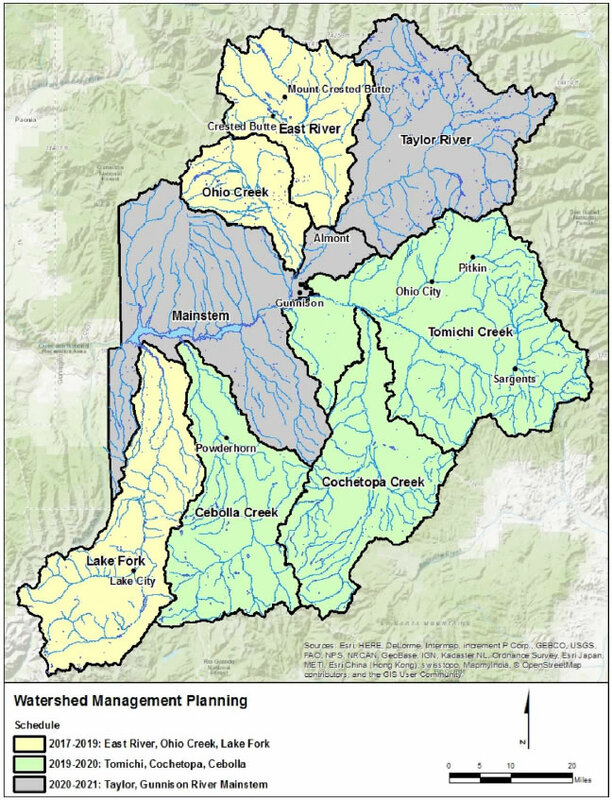 The mission of the Watershed Management Planning Group (WMPG) is to help protect existing water uses and watershed health in the Upper Gunnison Basin as we face growing pressure from increased water demands and permanent reductions in overall water supply.